Member: North Carolina State Bar; North Carolina Bar Association; American Bar Association; North Carolina Advocates for Justice; North Carolina Association of Trial Lawyers; Mecklenburg County Bar; North Carolina Bar Association Bankruptcy Group. Areas of Focus: Mr. Matthew Fleishman, "Matt" to his clients, represents individuals, families and businesses all across North Carolina. He has won millions of dollars for clients both in and out of the courtroom. Mr. Fleishman serves as the head of the civil litigation department for Rosensteel Fleishman, PLLC. He has successfully tried cases throughout North Carolina representing people injured in NC car accidents, medical malpractice, and other personal injuries. Mr. Fleishman is consistently requested by other lawyers to associate with them on cases involving serious injury or death. 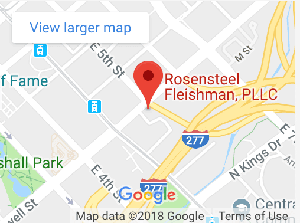 Rosensteel Fleishman does not advertise on TV, radio, the phone book or billboards preferring to focus solely on practicing law for our clients. Unlike many injury lawyers Mr. Fleishman does not accept every individual as a client. His focus is on the client which limits the number of cases Mr. Fleishman takes on in any given year. This is based on Mr. Fleishman's belief that only by working directly with the client can a lawyer effectively argue on their behalf. Mr. Fleishman was named Lawyer of the Year by the Mecklenburg County Bar LRS. Mr. Fleishman has received the highest and second highest financial settlements in the history of the Mecklenburg County Bar LRS. Outside of the office when Mr. Fleishman is not with his wife and family he is active in the Charlotte community and volunteers his time with local groups including Hands on Charlotte, a volunteer organization in Charlotte, where he sat on the Board of Directors for four years. All of the lawyers of Rosensteel Fleishman are in good standing with the North Carolina Bar. For the peace of mind of our clients this can be verified by visiting the North Carolina State Bar's web site at: Membership Directory.